Fast Characters - Mascot design and cartoon character illustration. that turns your ideas into great characters. Hiring mascot designers can be risky. Click to watch and learn how to stay safe. Sneak a peek inside a Character Pack! The world famous Character Pack has everything you need to use your mascot on and offline. Designing “Disney quality” cartoon mascots for you since 2005! to choose us for your mascot design. We’ll keep the concepts coming until you see something you like. You’re covered by our fair & simple money-back guarantee. Get 2-3 artists working on your mascot design project. Save time with a single point of contact project manager. Enjoy fast & friendly customer service we’re famous for. Our parent company is BBB Accredited with an A+ rating! Need a mascot design? You’ve come to the right place. Since 2005, clients around the world have counted on us to create mascots and characters that are compelling and capture attention like you want them to. As a mascot design company we deliver an entire experience, something so much more than just a single mascot character. You’ll find our mascot design service is five-star from start to finish. From our dedicated artists who bring traditional craftsmanship to every mascot concept through to our graphic designers who apply the most modern technologies for colouring your mascot. All while being guided by top project managers who guide your project through successfully from start to finish. 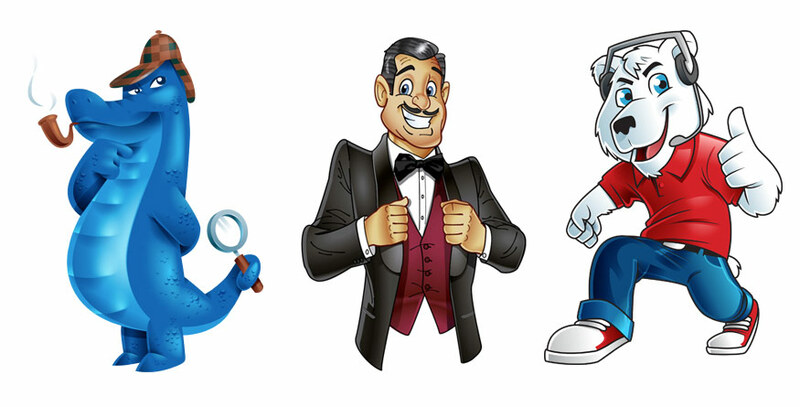 FastCharacters serves up great mascots in the USA, Canada and internationally to help personify brands, organizations and concepts in a memorable manner that only great mascot design can. FastCharacters is a part of Jumba Group Media Inc., a Better Business Bureau Accredited company with an A+ rating. When you work with us, you hire a team of professional artists that are just downright crazy about mascot design and character illustration and what you get is passion that shines through our service and designs that we create for you. We’re honored every single day that we have the opportunity to serve you doing what we love. With our unrivaled policies of unlimited concepts and unlimited revisions and a money back guarantee you can count on us, the world leader in mascot designs and we hope to continue to serve you do so for many years to come. When it comes to hiring a mascot designer or character illustrator we’re definitely not the cheapest studio around. 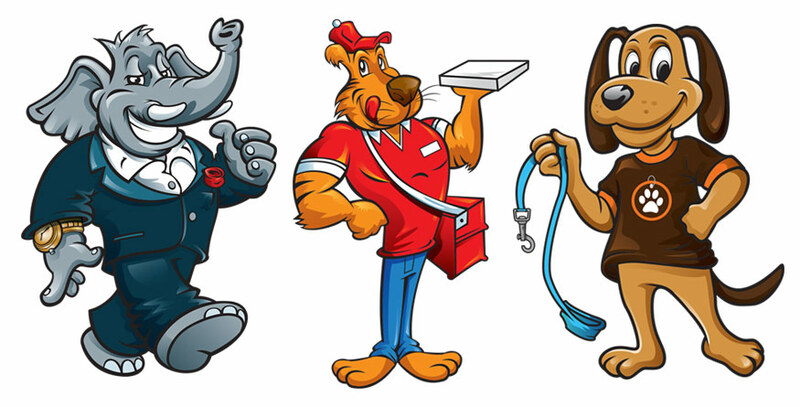 You could hire some mascot illustrator in a basement somewhere for cheap cheap cheap and hope he’ll make good on his promises … and you never know, you might have a great experience. That is possible. However if you’re looking for a sure thing in the best value money can buy – and one of the most honest, hard working mascot design studios on the planet, you’ve found it. No one beats us when it comes to value. We deliver an awesome combination of competitive pricing with top quality workmanship, industry leading policies (unlimited concepts and unlimited revisions), dedicated customer support, top project management, a massive body of work, a track record of success spanning a decade and to top it all off … a rock solid money-back guarantee which is unmatched and unheard of in our industry. No other mascot design studio delivers such a high caliber of buyer protection with high caliber workmanship. FastCharacters has been emulated (you know, copied) by many and matched by none. You can keep on shopping around or just pull the trigger and get started on your mascot right here right now. We’re ready to serve you. Business is all about serving people and it’s important (to us) that we try to help to make things better. To participate in a manner which contributes to improving the world around us. As a small mascot design studio our impact is limited by our resources – it’s not like we’ve got the philanthropic punch of a Fortune 500 company – however since day one we have been contributing talent and dollars where we can. To that effect we’ve been proudly supporting Kiva, a charity which provides microloans to entrepreneurs around the world. We’ve also been known to donate to Wikipedia whenever they do a fundraising drives. It seems important to keep the world’s largest Community created repository of information online for everyone to access. And lately we’ve been supporting patients who need operations at Watsi.org. Help a little? Check! Warm and fuzzy feeling for us? Check! We hope to continue contributing – and contributing more – as we grow and serve up more happy clients with our excellent mascot designs. “World’s leading mascot designers.” That’s a big claim right? So let us justify the claim without sounding like we’re tooting our own horn. OK maybe we’ll toot it just a little. How many mascot designers have amazing mascot illustration work like we do? Probably quite a few, we’ll concede that point happily. Next up, how many mascot designers will stand behind their work a provide you with unlimited concepts and unlimited revisions? None that we know of. Point for us. How many are so confident in making you smile they will protect you with a fair, plain English money-back guarantee? Put up another point for us. What about having an A+ rating with the Better Business Bureau? Point! What about delivering over a thousand mascots to happy clients? Point! Jokes aside, these aren’t points for us. They’re for you because all this adds up to the world’s leading mascot design studio that you can count on to get your mascot designed right. If you still have to think about it, go for it. We’ll be here, ready to serve you when you’re ready. Need more poses or your mascot dressed up? UNLIMITED CONCEPTS & UNLIMITED REVISIONS. Get your custom cartoon mascot today.